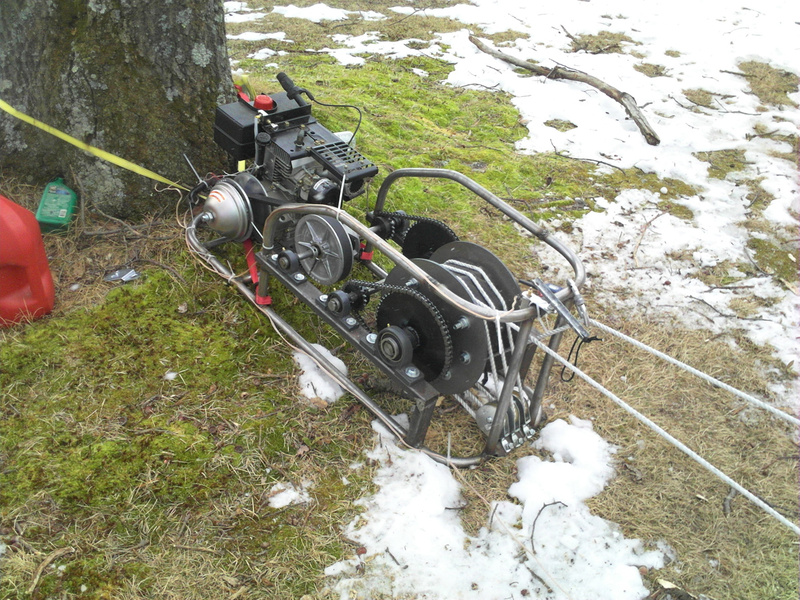 With the addition of the second clutch, we now use the winch for sledding by riding the line down the hill and then using it to pull us back up. It is much quicker to set up without dealing with the continual loop. This was also the first year we had GoPro cameras for video. We had the great honor of having a mention of our snow winch in Popular Science in the February 2012 issue. Between the Popular Science interview and when the issue was printed, we also managed to achieve wireless throttle control. We actually developed two working wireless remotes, one using walkie-talkies and Arduino and the second using Android phones on a hill-wide wifi network. Both were very exciting, however a broken power supply on the first remote meant we only ever used or tested the wifi remote on our annual sledding trip. We will work some bugs out of the remote and then see if Popular Science will let us have a full page! This project started as an innocent “oh, I have an engine” comment and has turned into a really awesome project. I first blogged about it here but decided it needed a permanent home. The winch is now fully operational and worked well during our first major sledding trip. The final winch set up involves an 2100 foot long rope that is spliced and will run all day long in a continual 1050 foot loop. The rope alone weighs 70+ pounds and the winch without the rope is close to 200 pounds. The three different shafts and accompanying gears result in a final drive ratio of 30:1-4.5:1 so it is capable of pulling three adults up a 30 degree incline at comfortable slow speeds or a rather bumpy high speed. Note the mountain bike grip shift toward the top of the picture, which is our five speed throttle control. Also barely visible in this picture are the three pulleys that keep the line from jumping as the line makes 4 passes around the spool before heading back down the hill. 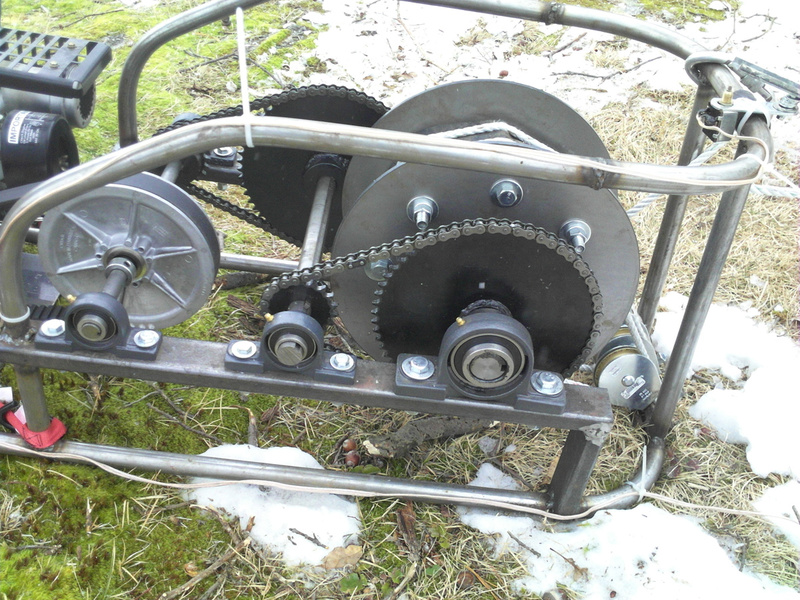 Here the main gearing and pillow block set up is visible. The wide gear range is the result of this monster CVT that delivers the power from a 8hp Techumseh Power Sport engine. As the drive pulley (on engine) speeds up the discs get closer while the discs on the driven pulley (right side of picture) get further apart. The various wires you see zip-tied to the frame are run three separate electrical kill switches that actually stopped the rider fairly quickly. The most effective kill switch was 15 feet in front of the winch and set up as a trip line. Glossy paint and some safety grills are on the to do list. Mentions: Makezine.com, DudeCraft.com, HackaDay.com, Neatorama.com, Gizmag.com, BikeHacks.com. So what happens when someone gets caught in the rope and gets dragged through the pulley? We had an electrical kill switch on a trip-wire 10 feet in front of the winch that would stop the engine if it was barely touched. We actually had to use it several times and it worked very well. As this was the first run, we also carried walkie-talkies to signal the operator to stop the engine as well. Thanks for your kind words Graham. The CVT is a two piece unit from CVTech in canada. We did all the fab work from the frame and bearing mounts. We now thinking about some modifications to use the same set up for winch boarding for summer use, so you could always do that with your CVT. Of course, I would also have to encourage you to build a Cycle Kart with your CVT. Thanks, it was lots of fun. The hike up this hill was usually 35-45 minutes, but with the winch was about 5 minutes. Looks like a solid piece of engineering. How about making the winch an add-on part of a cart? Drag the winch up the hill with the cart (snow tires? 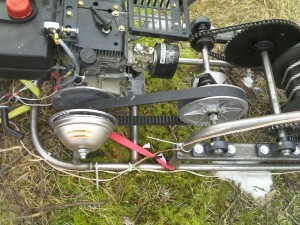 ), and then replace one of the wheels of the cart with a sprocket or something for the winch? This would probably reduce the build time a bit because of the re-use of the motor mount and cvt. If you can find one of those winches wich are used to pull gliders into the air, that would really take this to another level. The winch gearing would be pretty wild on the cycle kart but the immense size of the winch really makes it impractical. Speaking of gliders, The Red Bull Winch Sessions guys are now skydiving off of a winch (and vehicle) pulled para sail, so maybe next year we can skydive onto the start of the sled run. NICE! I would really love to see some drawings so I could try to build one myself. Infact – I would be willing to pay money for diy-plans 🙂 Let me know if you’re planning to document the whole thing. Although we had a plan and even some CAD drawings to begin, we actually just winged it on the build day. As such, there are no real plans but perhaps for version 2. Glad you like it. I need to build a winch for lifting parts onto buildings. The CVT you used – where did you get that part ?? The CVT is from CVTech-IBC (http://www.cvtech-ibc.com/?p=1.14815557003021) who I contacted to find a US supplier. It is definitely a heavy duty, quality part, but is is expensive. this is reaaaally amazing. stumbled onto the video and it got me here. this would be perfect for a backyard snowboard/ski terrain park. Just like a resort tow rope. if one was to try to replicate this, what were the overall costs of this insanely awesome project? Thanks, I actually have not tallied what it actually cost to build, but guess around $1,400. What is the material wrapped around your final drive drum? We don’t offer plans or have any machines to sell yet. We are looking forward to more snow this year to finish our wireless remote control system. The drum is laser cut steel with 8 steel bolts. The bolts have aluminum tubes over them to protect the line from the threads. We then wrapped the drum in rubber sheets, hoping for a little extra grip, however the rubber never lasted an entire day of use. We have since eliminated the continual loop by adding a second clutch so the line pulls out easily and there is no lengthy set up required. I think you have made a good choice with the Tecumseh engine. I have actually modified a Husky Superwinch to use it on a recovery platform and added a 6HP Tecumseh which is acting great. A Techumseh on a Husky Superwinch sounds like an interesting mix, glad it’s working well. I’ve been very pleased with the Techumseh. Any tips? Anything you learnt which should be avoided? go for it. The high gear reduction is necessary to pull a lot of weight, but it would need to be as extreme if you only plan to pull one adult and child. We can pull 4 or 5 men at a time. Also, a solid spool is better than a bolted spool like we used and we are in the process of converting because our bolts bent. Great to have your winch as an option to walking up! Are you interested in talking about developing this into a modular unit that connects to a couple of different motor/vehicle platforms? There are some really nice products in the pipeline and this might piggyback on the concept really nicely. Send me your email soon ok? Would you be interested in making me one of these for profit? If so, how much? Jeff, thanks for your interest. This winch is really a prototype and I wouldn’t consider selling a winch like this until we build a safer, production ready, second version. I have a list of several interested individuals, so I can certainly notify you of price and availability if that day ever arrives. I really liked your project and i am building something similar. i was wonder what did you used for the big “drums” to pull the ropes? I am struguling to find something “cheap” to use it? Fernando, I had the drum sides laser cut at a local commercial fabrication shop. The sides cost $60 USD total. 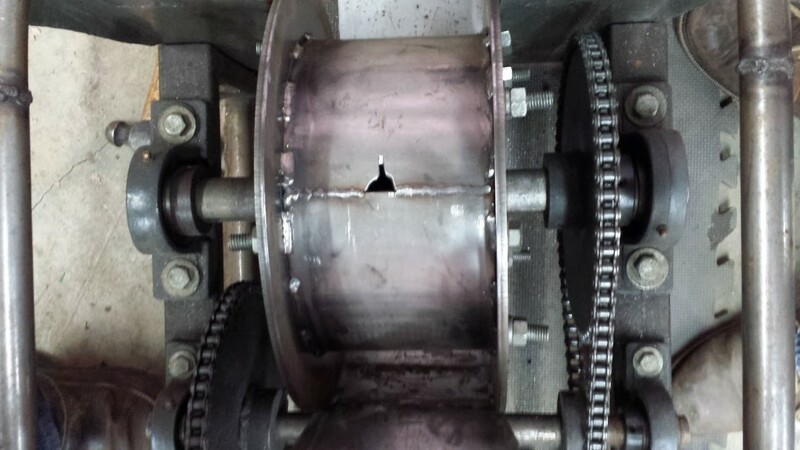 At first we had 8 holes spaced in the drum sides for bolts, which provided the structure and inner diameter and you can see a better picture on this post: http://cyclekarting.com/cyclekarting/excuses/. The bolts bent after several years of use and I replaced the bolts with solid structural steel piping that we pressed and welded into place around the bent bolts. I’ll update the post with a picture of the current drum. Did you use JB weld in the 90 degree joint? Is it strong enough? do you have an email that i could communicate with you for some tips? Fernando, Sorry I don’t check comments on this site often. The corners of the 90 degree joint are welded and we’ve never had any issues with welds breaking. I’ll email you separately. This is really innovative guys. I appreciate that you share the technical details behind your build. I’m the owner of Phoenix Winch LLC. If you’re ever in AZ, make sure you reach out to me and we’ll show you some winchin hospitality! Ryan, If I’m ever out that way I’ll look you up for sure! Your winches look great and I really like the dual spool setup! Cheers.